I’m not a cold weather person, but I do appreciate winter as a time to rest and regroup. I’ve put the garden “to bed,” mulching and dead-heading all the perennials, made notes in my journal as to what plants did well or were moved to another location, and break out my knitting and quilting projects! Autumn is a wonderful season to watch unfold. I love the crispness in the air, the glorious colors of the leaves, and the harvest. Each year, our family has always looked forward to apple picking; a tradition that both my daughters extended with their families. This past fall, I went to visit my sister in the Shenandoah Valley and we went apple picking. When I came home with my apples, I had enough for 18 jars of Apple Butter to enjoy through the winter! As my scene progresses into this season, you can see I’ve focused on the harvest. The leaves on the trees are turning a bit and there are bushel baskets and a wheel barrow full of apples. Today’s project shows the changes coming to my scene. Apples are forming, the Blue Birds are visiting, and two of our cats, Harper and Clara, are hiding among the terra cotta pots of red Geraniums and Shasta Daisies in hopes of “playing” with the birds. I used this verse as my inspiration to create an unique visual of what it means to me. I chose my CountryScapes Apple Tree as the focal point of depicting the four seasons. Today, I’m starting with Spring, but each day this week I’ll do a different season and on Friday I will show you the finish project I’ve done with a lovely Give-Away. If you post a comment on any of the following days, you will be entered. December is just a few weeks away and I knew it was time to do the calendar page to finish off the 2015 with some sparkle. Aluminum trees were a fad in the 60s and I remember my mother wanting to change out our usual evergreen for one. Money my grandfather had given her for Christmas was spent on this trend that would bring her years of pleasure. Since Christmas was my mother’s favorite holiday, I wanted to honor her memory and create my own version of an aluminum tree with the help of Silver Metallic Shimmer Sheets (SS0211) and my Holiday Evergreen (#1093) die. I couldn’t replicate the “color wheel” that illuminated the colors on the branches, cut I could do the next best thing and trim them with Sticker Dots (#7018) in my favorite Red. A few presents, pots of Poinsettias and a bough of evergreens completes this cozy scene. 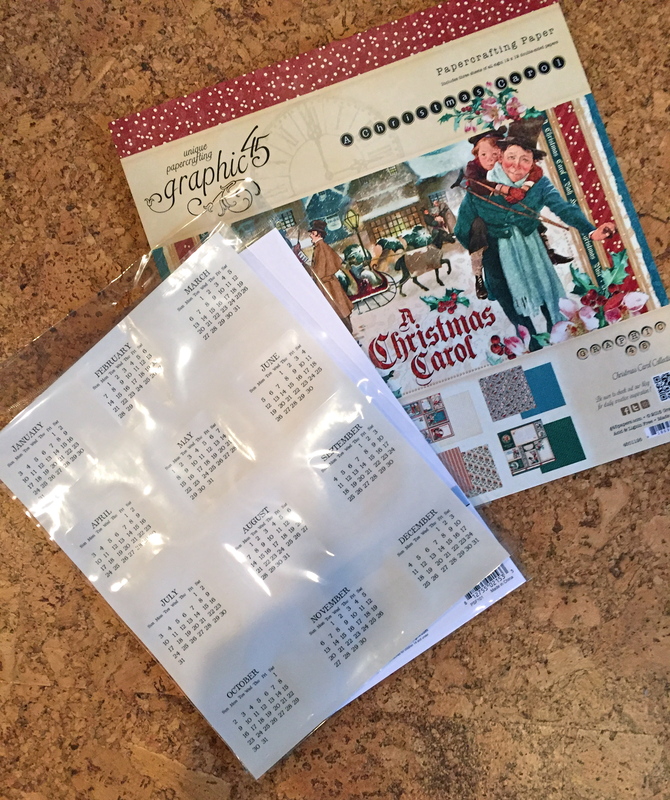 For the third week of “Joy of Giving,” the giveaway will include: Graphic 45’s collection~”A Christmas Carol,” a sheet of 2016 Calendar Months (from Rosie’s Roadshow), a package of Elizabeth Craft Designs Soft Finish 100lb cardstock (PSF102), my CountryScapes – Build A Snowman (1081) and CountryScapes – Clouds & Grass (1094) dies. Next month, we can start the new year with January’s calendar together. Comment on this post: What is your favorite Christmas/holiday memory? The winner will be announced on Saturday, November 21st. For me, November is the start of the holidays. The air has a chill, the trees still have some color, pots of flowering Kale have replaced fading perennials, and squirrels are aflutter gathering acorns for the winter. All of the sudden, Thanksgiving quickly approaches at the end of the month. Some of my fondest memories will always be of helping my mother prepare Thanksgiving dinner in November. 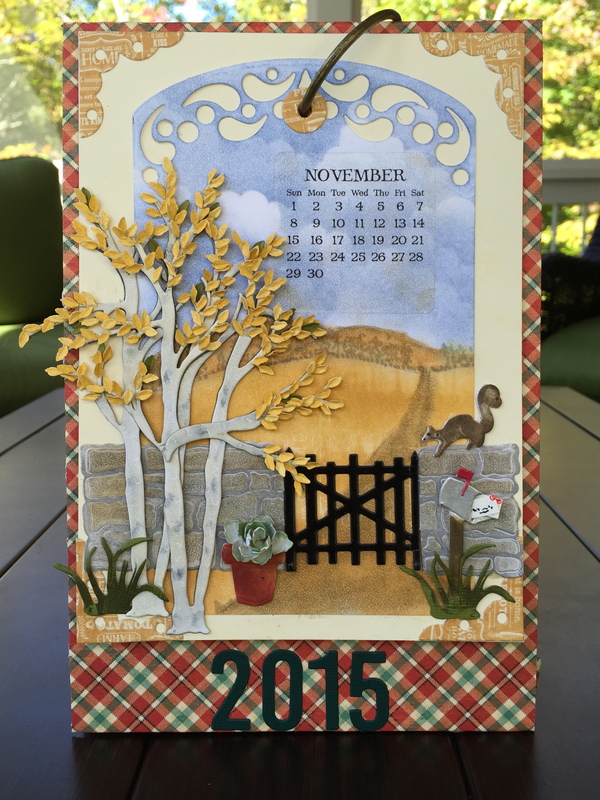 I chose Birch trees as my focal point of this month’s calendar. In every home we’ve lived in, I’ve made sure to plant a cluster of Birch trees – they’re one of my favorites. The leaves turn a beautiful golden yellow as autumn sets in. In front of the stonewall, the Birch trees have created a welcoming entrance to my Grandmother’s house. 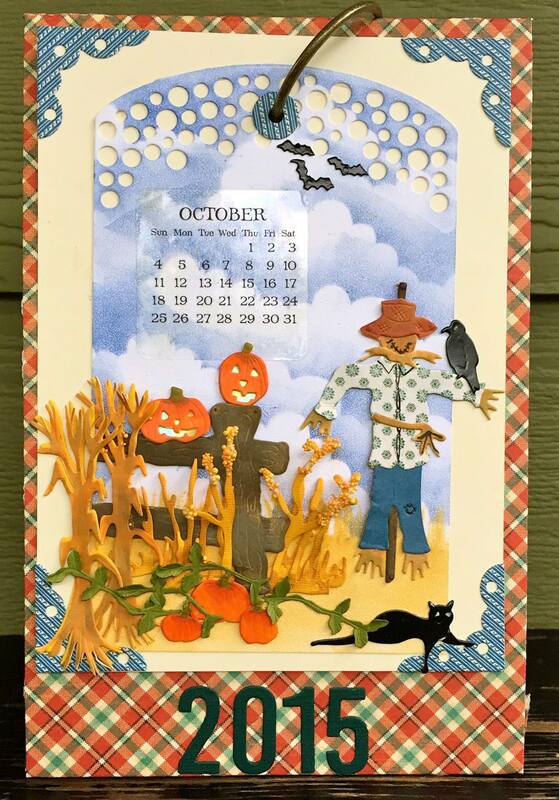 I hope this calendar brings back warm autumn memories for you as well. As a gardener, calendars play an important part in my life. In January and February, I look forward to the first of many seed and flower catalogues in the mail. When March and April come around, I order top soil to amend my flower beds and mulch to cover them; it keeps the weeds down and moisture in the soil. By May and June, I’m in full planting mode so I can enjoy summer blooms. In late August and September, I’m pursuing nurseries for gardening sales – especially on perennials. The fall months are left for cleaning up the beds and pruning flowering bushes. In December, our home is decorated with cut pine boughs, holly, and poinsettias. I think you can understand why I decided to do a series of calendar projects with my CountryScape dies! 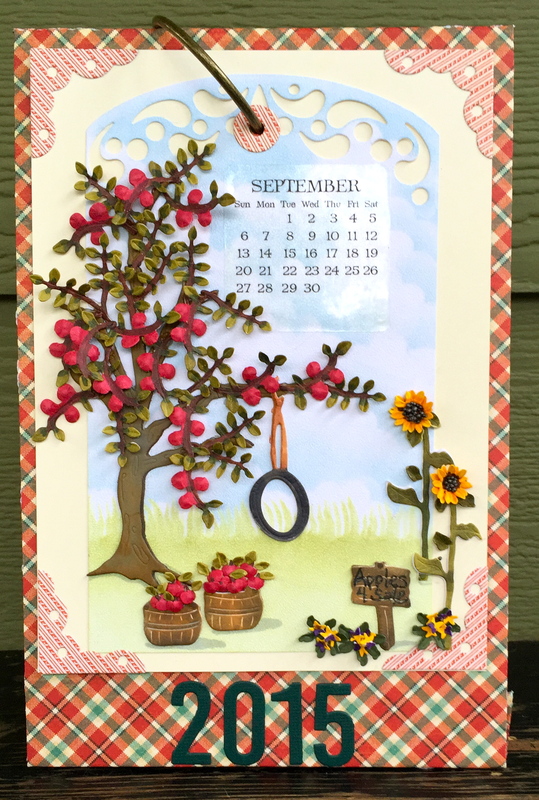 By using my CountryScapes dies to create this series of calendars, I’m bringing back memories of my gardening and telling my story. I have already started with September and October. Later this week, I will post November’s calendar with steps and suggestions. I could have waited to start the year 2016, but I was inspired by the beautiful fall weather – as well as apple picking with my sister in the Shenandoah Valley this past weekend. Plus, wouldn’t these make great keepsake gifts?